Students in Carnegie Mellon University’s Dietrich College of Humanities and Social Sciences and College of Engineering joined forces to come up with a plan to decrease the levels of lead in Allegheny County. The group was guided by Paul Fischbeck, professor of social and decision sciences and engineering and public policy, as well as the Department of Engineering and Public Policy’s Deanna Matthews, associate teaching professor, and Ph.D. candidates Gerad Freeman and Sara Schwetschenau. The Allegheny County Lead Task Force had reviewed data regarding childhood lead exposure, strategies for screening and examined possible policy recommendations. The CMU students picked up where that report left off. The issue of lead levels was broken down into several areas: identifying high-risk zones for lead exposure, determining the accessibility and effectiveness of test kits, assessing the public’s awareness on lead risks, where knowledge can be improved and the physical mitigation and policy strategies to implement lead abatement and reduce an individual’s risk of exposure. As part of their project, students built a cost-benefit model and merged that with knowledge from the exposure and mitigation research to develop a decision-making tool for homeowners in Allegheny County. The tool allows homeowners to assess the paint, soil and water lead hazards in their home. Throughout the spring semester, Nick Chmielewski (DC’18), a psychology major with minors in social and political history and business administration, worked in the physical mitigation group and looked at how to lower children’s blood lead levels through mitigating lead associated with exposure through paint, soil and water. Chmielewski found this the most interesting part of the project. 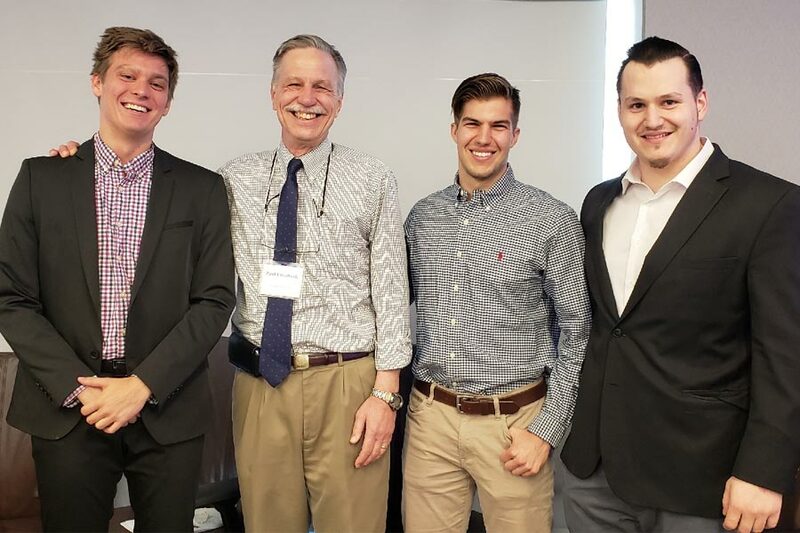 Pictured top: Patrick Dykiert, Paul Fischbeck, Connor Cipp and Nick Chmielewski after presenting on decreasing lead levels in Allegheny County. Pictured center: An example of the homeowner decision tool developed by students in the course.